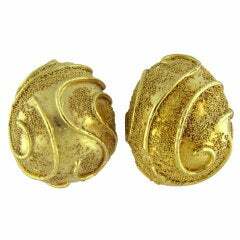 A pair of 18k yellow gold earrings by Elizabeth Gage, set with approx. 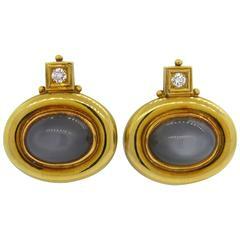 2.20ctw in G/VS diamonds and 15.8mm pearls. 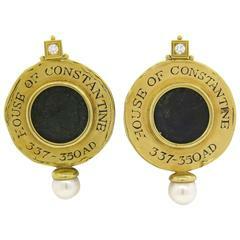 Earrings are 42mm x 25mm and weigh 38.8 grams. Marked Gage, EG, 750, English gold assay marks. 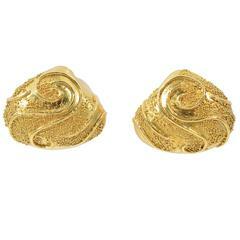 Diamond and cultured Pearl yellow Gold Earrings. Elizabeth Gage. Contemporary work. 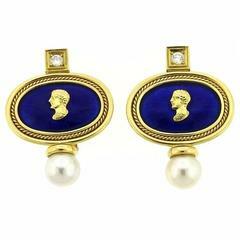 Elizabeth Gage frames this classic domed earring with a beautiful intricate pattern. 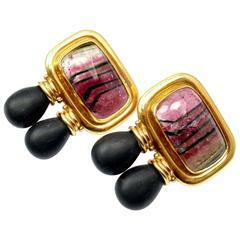 Wearable art !!! 7/8's of an inch in size. 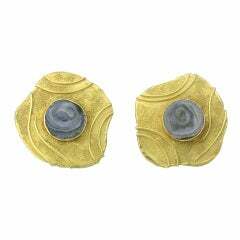 18k gold Trefoil earclips set with 3 lapis cabochons. Signed GAGE, English marks.